The Stokke Tripp Trapp® chair is designed to fit right into your table, bringing your baby into the heart of your family. However, for certain occasions the Stokke® Tray which fits on the chair with the Stokke® Baby Set can be a convenient accessory. The child should be properly secured in the high chair at all times by the harness restraint system. The tray is not designed to hold the child in the chair. It is recommended that the high chair be used only by children capable of sitting upright unassisted. Risk of tipping over – a child hanging on the tray, or excessive weight placed on the tray, may cause the chair to tip over – never leave your child unattended. Do not leave the child unattended. Never place any hot liquids on or near the tray. Never attach or remove the tray when the child is in the chair. When attaching, ensure that both hooks on the tray are properly locked under the edge of the plastic rail before locking it in the middle. Make sure that both the Tripp Trapp® Baby Set™ and the tray is properly fastened prior to use. Easy to take on/off and easy to clean. This tray is a great addition to the tripp trapp seat when you're not using it pushed up to a table. Although the purpose of the Tripp Trapp is to have the child at the table with you, the tray is helpful for starting solids with an infant and worth the money. I find it easier to have him facing me when I am feeding him (and safer) and it is also easier to clean than my dining room table as he is starting to explore all sorts of food textures with his hands. This product itself is great. 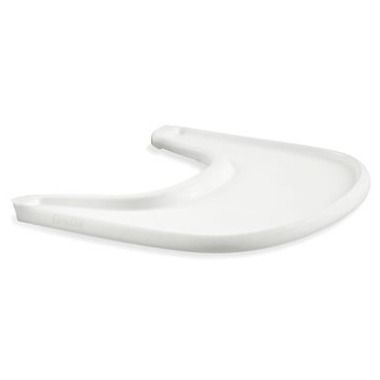 It is a great addition to the Stokke Tripp Trapp set in case your table or counter is not the proper ergonomic height for the chair. However be aware that this tray only fits on the baby seat V2/V3 and this is not stated anywhere but the fine print on the box. It unfortunately didn't fit our existing baby set but well.ca was fantastic to deal with.